Several of my cloak clasps are of the Penannular design: a fastening brooch used by the Scotts in their traditional wear. Typically, the style I have been creating is for the Ladies, the Lads use a circle with what looks like a decorative hat pin or small thin dagger to fasten their clothing. This technique of fastening their garments served in several ways: one was to hold their Great Kilts together; another was to give them a last ditch should they be faced with opposition. Hence the old saying: “If a Scott is wearing clothes, he is armed”. 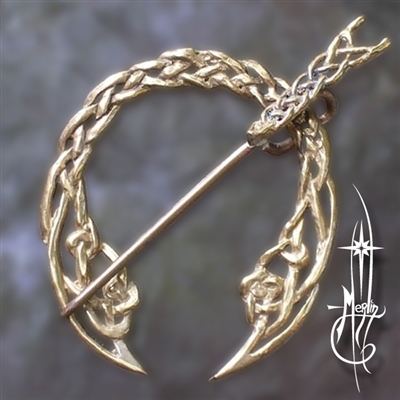 Unlike the mens brooch, the more genteel Penannular had the pin as well, yet it is solidly attached to the frame: usually a horse shoe in shape. This allows for the clasp to be more versatile and provide the user with the ability to keep all of the components together. The more traditional ornamentation is knotwork, a style of decoration used among the Celts to illuminate the piece. Styles of knotwork range from the classic shapes from the Book of Kells to the bizarre Zoomorphic styles that incorporate animals and sometimes people into the knots. In the more shamanic versions the knot was not a repeated pattern but a somewhat free formed shape but had to be all one strand. Thus the person who gazed upon it could follow the strand from “beginning to the end” and they would wind back where they started. In the creation of the Knotted Penannular I blend the classic shapes of the old style Ladies’ Penannular and the shamanistic style of knotwork, yet conforming to the regular shape forced a more repeated pattern. The over all result is a period piece for the medieval and renaissance fairs rather than fantasy art. Each of the Penannulars I make are for the heavy cloaks: stout pins and solid frames for years of wear. This would do well on a jacket, too. I would recommend for the more mainstream garments you use button holes for the pin.